This PDF 1.5 document has been generated by Microsoft® Publisher 2013, and has been sent on pdf-archive.com on 04/11/2015 at 03:29, from IP address 50.133.x.x. The current document download page has been viewed 165 times. invisible those outside the industry. of technology has only become more complicated. left unutilized and at worst, they are used incorrectly. enough without the complications of IT. consistent service at all times. healthcare, or are simply ill equipped to meet them. aware of how to judge their potential partners. Corporate IT Solutions © 2015 All rights reserved. themselves to an efficient transfer of data. between medical facilities and their IT providers. towards a unified records management system. the demands of different types of medical facilities. and EMR vendor to ensure a fluid deployment. implementation for the first time. provider hoping to support medical organizations. care we want to receive is going to be of high quality. additional funding in order to ensure it isn’t wasted. that isn’t to say it doesn’t cause any obstacles. ensure any new or altered guidelines are being met. systems and policies as well. implement them, they won’t be of much use. reduction is top of mind for any administrator. able to resume quickly and with little impact. picture of their patient’s lives. equipment is simply not an option for many facilities. 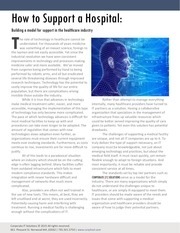 medical facilities must fit within a certain framework. affects the workflows and processes of its clients. have a culture of self improvement and growth. This file has been shared by a user of PDF Archive. Document ID: 00312484.